It’s clear that content can become more contextual and personalized as it transects with location based devices. A few weeks ago the folks at the company MotherApp, created a “Web Strategy iPhone App (download in iTunes)” to take on the go. This isn’t just a “m.” mobile website that shows essential content minus heavy graphics, this is a true iPhone app, with the native interface of Apple products, see screenshots below. I’m not the only one, they created the app for Tim Ferris (iTunes), Guy Kawasaki (iTunes) and Brian Solis (iTunes) and others. The content can be accessed on an iPhone, even if there’s no internet connection, the content is downloaded. Secondly the content is in a clean Apple native user interface making it easier to read and navigate, rather than some clunky “m” looking site. Also, you can serve up a variety of content sources related to your brand. Also, the app has location based content, I’m looking at Brian’s app, and it can serve up Fan comments based on location (it asks you for your current location, first). In the future, it would be interesting if two fans of Brian Solis’s app would be signaled to each other they are in proximity, resulting in unique engagements. 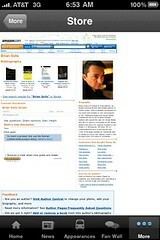 Brian’s app links directly to his amazon page, where his books (products) are available for sale. 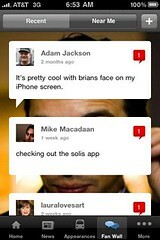 Brian Solis’s Apps Filters Fan Wall Shout Outs By Proximity. 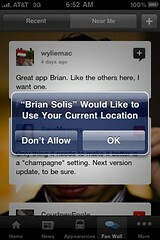 Conversion: Brian Solis’s App Promotes His Books, With Links to his Amazon Store. What’s the downside? The URLs and comments are visible, only my voice. In the future, I’m sure these will be native into the app, so the community can talk back. The barriers to entry are still high, you’ll need to find an app developer to build this for your iPhone or other mobile device. It’s not just personal brands, I recently noticed the Forrester Consumer Forum iPhone app that listed out the schedule, top topics “What’s hot” based on attendee votes (I think) and the ability to create a schedule of tracks to attend. 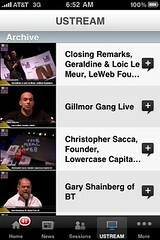 LeWeb has the most impressive event iPhone application, with links to previous videos, session list, news, maps, and speaker roster. Nearly the entire event website was ported to the device on the go. 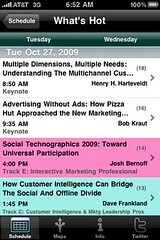 Forrester’s Consumer Forum App Highlights the “Hot” sessions. No doubt, of course, it’s Josh Bernoff. Expect majority of top blogs to have mobile apps within the next few months, at first they will be custom created, then a platform will emerge allowing them to quickly ported to multiple platforms (blackberry, droid, etc). This platform will emerge that will create this blog network, and new advertising opportunities will emerge who are able to cascade the information to the mobile devices. Players like Federated Media, Blogher, should move quickly. 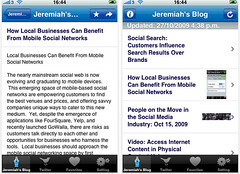 Content will become location-based, as blog posts, tweets, and other content is based on a specific area (a foodie blog, reviewing restaurants in Mission district, SF) the content will auto-surface to the application when needed. A standard will be set for all conferences and events to have a mobile based event that encourages members to find out about sessions, find other attendees, and even tweet from it. I’ll continue to experiment with the Web Strategy brand in a variety of mediums, to test, and report back to you what works and what doesn’t.